’Tangram Play Landscape’ - A public play area based on the geometry of the ancient Chinese Tangram Puzzle. Commissioned as a space that adults and children could enjoy. Tavistock Gardens, London W1. Oak sleepers, cast concrete, marble pebbles, concrete paving, coloured rubber surfacing, Kee Klamp tubular steel. Commissioned by Notting Hill Housing Trust and The Royal Borough of Kensington and Chelsea . 2002. Winner of the Kensington and Chelsea Environmental Improvement Award 2002. The Tangram puzzle is a square divided into seven geometric shapes. With it an huge variety of forms, figurative and abstract, can be created. Sea creature designs by pupils at a local primary School were incorporated into the paving. 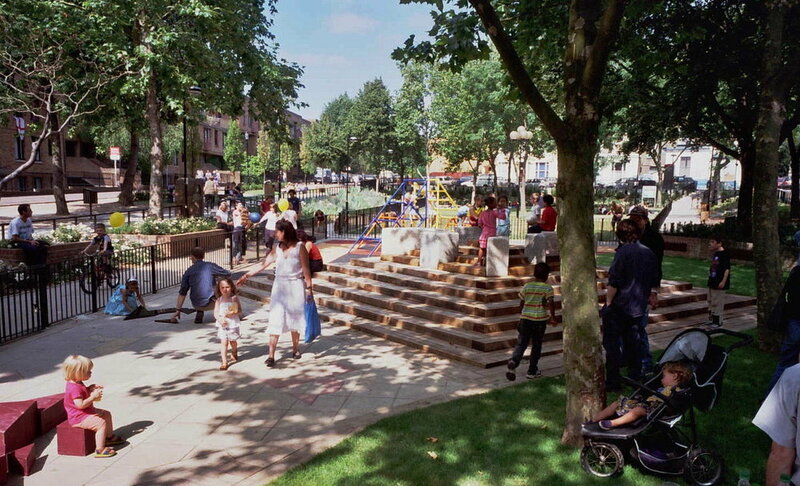 The playground was squeezed into a section of an urban park and made clever use of the available space.